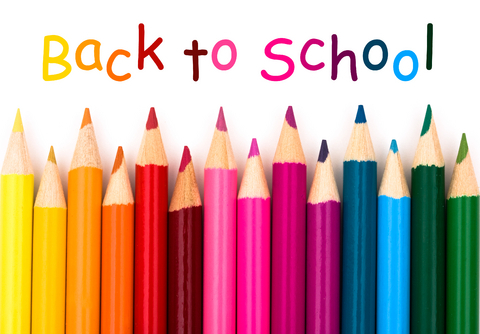 We are back to a school and gearing up to do some great things! 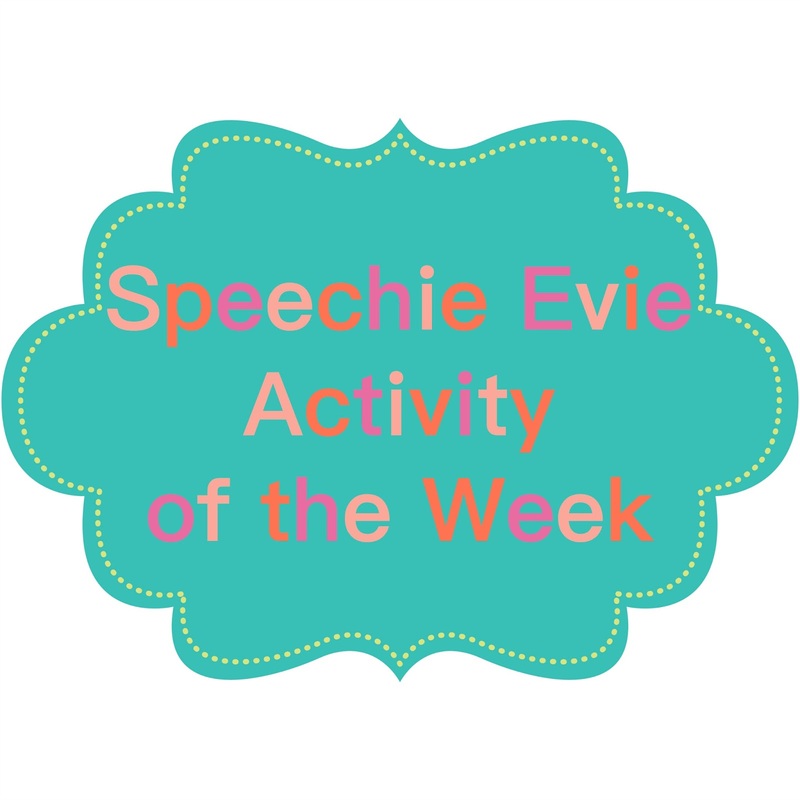 With the beginning of the school year, I wanted to reinstate my "activity of the week" recap with you. It was a big hit last school year and I hope it continues to be! This year, when I assign homework, it will be given once a month and will come in a packet of 4 pages. With an average caseload of 60 students, preparing individualized homework takes a lot of time to prepare, so doing it once a month helps me cut down paper costs and planning time so I have 3 weeks in-between to organize what I want to send home. In order for students to get credit for homework, they must have a parent sign the page to show it was reviewed at home (more for artic students, see below). When homework is turned in I offer a reward program of earning 1 piece of candy from the candy box and one sticker on a reward card. There is a system in place for students to earn additional rewards if they accrue more stickers on their chart. I will probably do a separate blog post about those in the near future. For articulation, I am trying a new format with Speech Club by Super Power Speech. 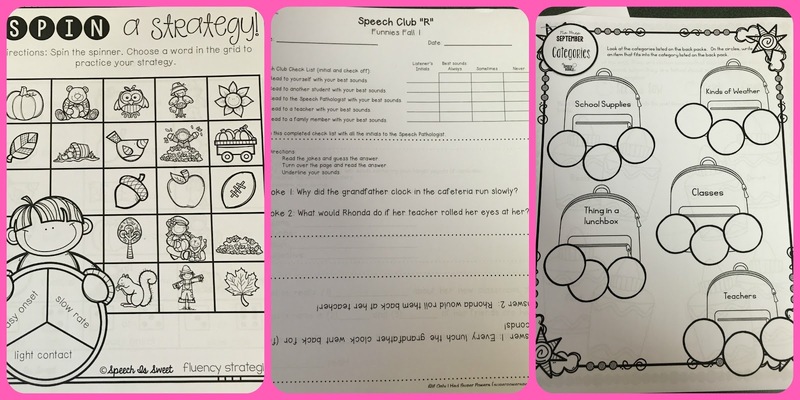 Each student received 4 pages that target the sound they are working on: funnies (jokes), mad libs, fill in the blank paragraph reading practice, sentence drill with tic tac toe. The students seemed to love these fun and unusual approaches to practicing their speech without really doing boring drill work. My favorite part is that the student has to get initials from themselves (self-rating/monitoring), a peer, me (SLP), teacher, and parent. What a great way to generalize their sound into other settings and get everyone else on the same page! For language, I used The Speech Bubble's No Prep September Homework. I also like to use her Visuals to Go pack to teach the various skills we are learning about. 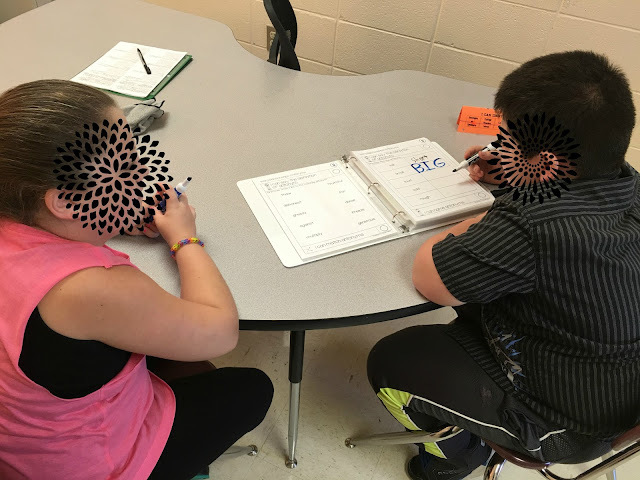 Targeted subjects included vocabulary (multiple meaning words), categories, irregular verb tenses, predicting, inferring information, and comparing/contrasting with a venn diagram. 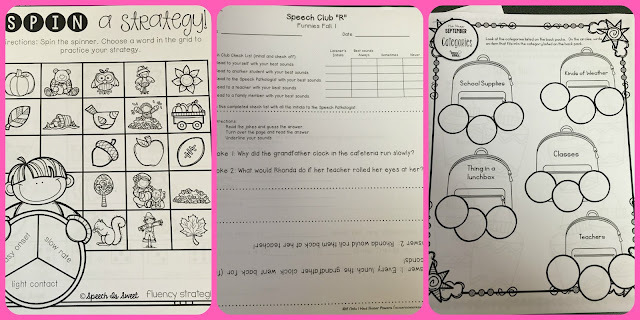 For fluency, I used Speech is Sweet Fluency in a Snap and we practiced smooth speech techniques of easy onsets, slow rate, and light contacts to talk about a fall object. We also identified and practiced the different types of stutters (psuedo stuttering) like repetitions, interjections, prolongations, and blocks. For social and pragmatic language, I like to do homework modules from the Simply Social 7 book series. This week's topic was about expressing our opinions. We discussed the difference between sharing and dominating an opinion, how to respect the opinions of others, and how to have an opinion and not be bossy about it. I also like to use the goal sliders by Speech to the Core so students can know and have a visual about exactly what we are working on. No more "I don't know!" when asked about what we worked on together. I love these because it has a wide range of skills to show for SLPs and the students can eventually use the back to monitor how they think they did for the activity. Happy speeching! New window treatment. The students still LOVE my solar powered toy collection! Disney! 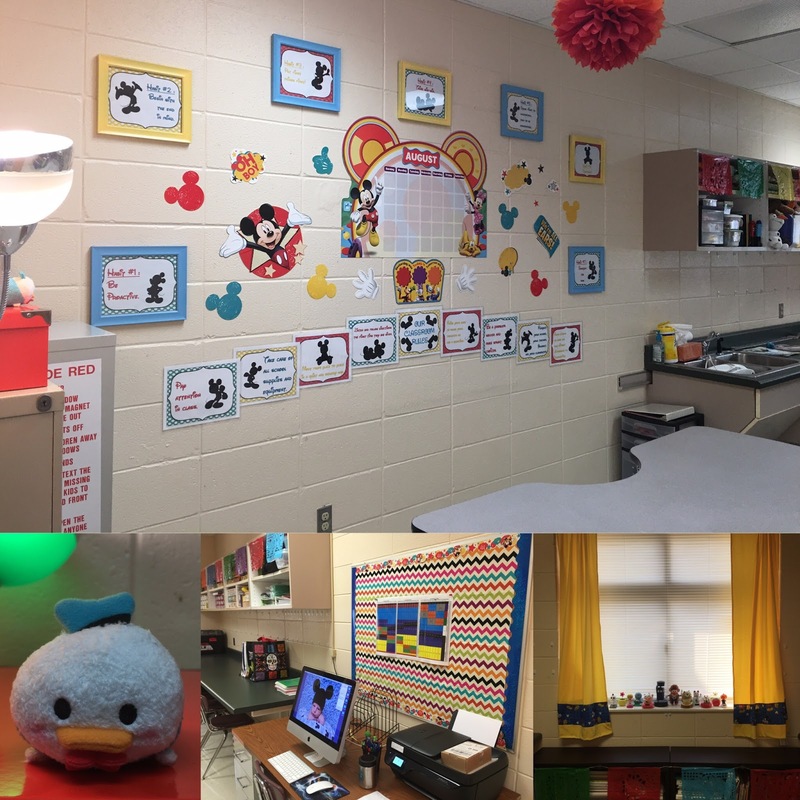 I love seeing Mickey and pals every day when I come into the classroom. 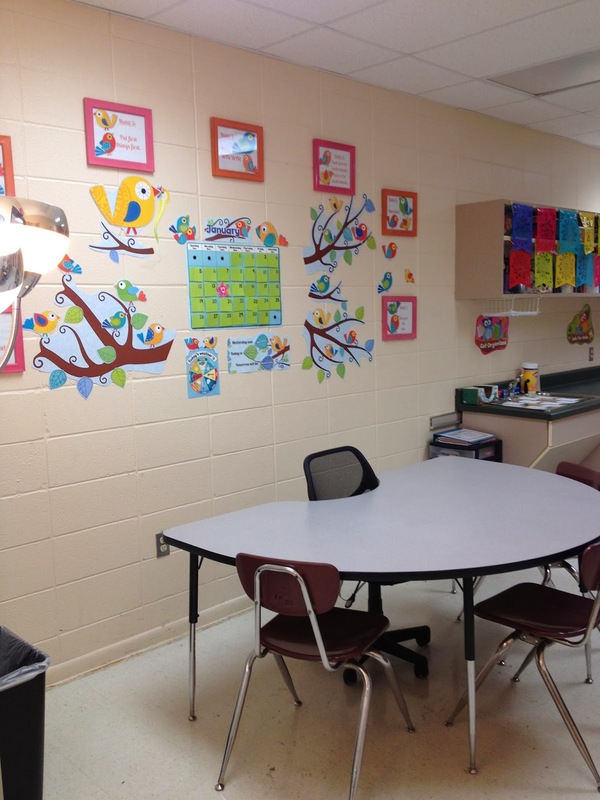 Another view of the work space for students and myself. I love the pops of color to really brighten things up a bit. Of course I kept my 7 Habits picture frames to remind students of the successful steps to being a student. I had a LOT of fun redecorating my room! I hope you like it as much as I do! I also had the amazing opportunity to get trained professionally in the PECS early phases system by Pyramid Education. It was a 2 day training and I personally believe it was some of the best training I have EVER received in my career as an SLP. I left the seminars with very clear and informative techniques that I could begin IMMEDIATELY in my therapy room, which is something I find lacking in many CEUs. Most of the time the conference discusses and deals with theology and theory but is short on therapy approaches and techniques. This conference was a perfect blend of everything and I hope to continue to do more training in this approach again one day. Last, I have a new student this year that came with a personal Dynavox AAC (augmentative and alternate communication) device. This is something that is slightly new for me and I welcome the challenge! I've been collaborating with the student's parent and teacher to make sure we can customize the screen, options, choices, and ability for him to express himself effectively. This is a great learning experience for me and I cannot wait to see where we go on this professional and personal journey! I love being a speech-language pathologist!